Home » Protein » 1st Phorm Level 1 Review: Protein Of The Highest Level! 1st Phorm Level 1 Review: Protein Of The Highest Level! I have to say Level 1 truly lives up to its promise! It gives you the BCAAs and protein you need while keeping carb and calorie counts low so you can build lean muscle mass without putting on unwanted weight. We’ve all heard about protein and how it is essential in building muscle. But not everyone has the time (not to mention budget) to buy fresh meat to be cooked every night or fit a protein-rich diet into their everyday routine. So how do you make sure you’ve got enough protein into your body? Take Level 1 from 1st Phorm. Level 1 is an on-the-go product that can act as a meal replacement which helps you fuel your protein intake to give you the nutrients you need as well as aid you in growing and repairing those muscles. It’s the most delicious, best mixing and most of all highest-quality protein on the market. Level 1 is one of the best products you can get your hands on plus it guarantees no funny, nasty aftertaste, gas, bloating and stomach discomfort making it worth a try! So what makes this product the BEST? The ingredients that’s in it of course! 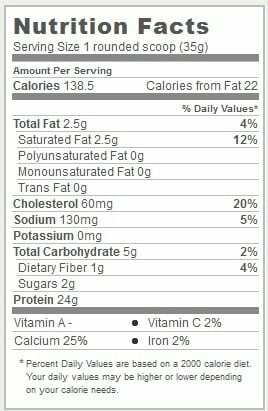 Check out this label of its nutrition facts to know what you’re getting. I’ve also given a brief explanation below of what’s in it if you’re skeptical to accept why Level 1 is the bomb. Level 1 is comprised of Level 1 Matrix which consists of Cross-Flow Micro-Filtrated Whey Protein Isolate, Low Temperature Micro-Filtrated Whey Protein Concentrate, Low Temperature Processed Milk Protein Concentrate, Pure Egg Whites and Sodium Caseinate. Level 1 Matrix is an ultra bio-available (the amount of nutrient that is absorbed by the body), sustained absorption formula that deliver the finest quality, superior proteins (that won’t damage fragile protein sections) which imitates the protein absorption rates of whole food. Other ingredients include: cocoa, non-fat dry milk, non-dairy creamer, modified food starch, cellulose gum, Xanthan gum, artificial and natural flavor, salt, sucralose and acesulfame potassium. For men: Add 2 scoops to 8-ounces of ice cold water or milk. For women: Add 1 scoop to 4-ounces of ice cold water or milk. *The amount of liquid may differ depending on your desired flavor and consistency. Shake well or blend for at least 30 seconds or until smooth. It is safe to use and you shouldn't experience any major side effects, although there is a slight possibility you get some minor ones such as nausea or thirst. There is a possibility you get those minor side effects from any protein on the market, and we haven't yet heard anyone's complaints about negative effects of Level-1. What do other people think about this product? I have to say Level 1 truly lives up to its promise! It gives you the BCAAs and protein you need while keeping carb and calorie counts low so you can build lean muscle mass without putting on unwanted weight. It’s a great meal replacement and my shakes always have that extra “oomph” thanks to its unique, luscious flavors. Even better, I have not experienced any negative side effects. To date, this is the best protein supplement made! Go ahead and get your Level 1 at this link with free shipping. See the difference for yourself! They offer 110% money back guarantee on all 1st Phorm products if you're unhappy with their products. Also, if you’ve tried Level 1, feel free to share your review in the comments below. I absolutely love this protein and all 1stphorm products. They are a great brand and truly care about each and every customer on a personal level. They have my complete support. It’s a very cool protein, having so much in it, I replace my meals when I have to jump from work right to school. I mix it in the car and I am good to go. I cook a lot , but sometimes I am a meal short , and some proteins leave me little weaker, this one actually keeps me going for hour or two until I get my meal in. I really liked the result as well. Not only is the product good, the company itself is awesome. Customer service is by far raising the bar. The processing from order to ship was same day. They are quick to answer questions, very knowledgable and super friendly. Trully a one off experience. The product is the best tasting bu far. I have tried sever dofferent brands before trying 1st phorm. For me this is my last. The ingredients are the best, the process to make the product is as well. My body have never felt better since taking their products. You WILL NOT regret purchasing. I always here “its too expensive”. Yes because you are buying quality. You get what you pay for. Go buy the 5lb tub of a competitor if you are worried about the price. But you are just putting in stuff your body doesnt need and wont use. For the Level 1 ice cream sandwich protein is it a chocolate base or vanilla? Military Whey Review: Another Protein Of A Questionable Quality? 310 Shake Review – Way Too Pricey To Be Any Good! Pro-Antium Review – Ronnie Coleman Is Back At It Again With Another Outstanding Protein Powder! Pro-Antium Review: Is this the Protein Blend that Gives Maximum Recovery?